Whenever people say that clouds are distressing, they often refer to nimbostratus clouds. Do you feel the same way? If so, why not examine how this particular type of cloud develops, its appearance and weather system it brings? Learning more about nimbostratus cloud is actually interesting. Nimbostratus clouds are cloud formations that often bring moderate to heavy rainfall. It is named from the two Latin words, nimbus which means “rain” and stratus for “spread out”. Nimbostratus clouds form thick and dark layers of clouds that completely block the sunlight, thus making them responsible for gloomy, dull and wet days. The emergence of nimbostratus clouds indicate that a warm frontal system is advancing. It is also classified under clouds with vertical development. How does a Nimbostratus Cloud look Like? This cloud exhibits a thick, grey and featureless appearance with indistinct outlines. It often brings relatively continuous rainfall or snow making the base of the cloud thin and smooth. Nimbostratus clouds not just obscure sunrays but also cast everything in miserably gloomy light. When found at the middle cloud layer, they can produce moderate rainfall. But when found at a lower altitude, they bring heavy rainfall or snow showers during the winter season. At What Height is Nimbostratus Clouds Found? Nimbostratus belongs to the middle level cloud group but it can develop at low level altitudes as well. They, therefore, can be found anywhere between 2,000 feet to 9,000 feet from the Earth’s surface. These clouds can be largely made up of raindrops, snowflakes or ice crystals. However, their composition greatly depends on the temperature and can be sometimes mixed with ice crystals and super-cooled water. How is Nimbostratus Cloud Formed? These clouds form as a result of the gradual rising of moist air into a large area due to an upcoming warm front. The warm frontal system gradually lifts the warm and moist air into the atmosphere which condenses to form into clouds. 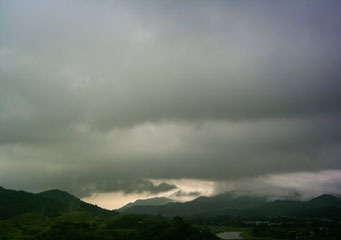 Nimbostratus clouds may also form from other cloud types. This occurs when the altostratus cloud gets thicker and descends to lower elevations. It may also be born from the spreading out of cumulonimbus clouds. Unlike other main cloud genera that have species and varieties, nimbostratus does not have clouds species or varieties. However, it may take some special forms such as nimbostratus virga which has drop strips underneath the cloud; nimbostratus praecipitatio when rainfall reaches the ground; and nimbostratus pannus which appears as torn-out clouds developing in between the cloud base and the ground surface. How common are Nimbostratus Clouds? These clouds, forming thick and extremely widespread grey cloud layers at lower elevation, are very common all over the world especially in mid-latitude regions. The nimbostratus cloud is primarily responsible for bringing moderate to heavy rainfall or snow which is generally prolonged. Nimbostratus is not a welcoming cloud feature if you are planning an outdoor activity. However, farmers take delight in the presence of this cloud type during the summer season as it helps get rid of the dry spell. Besides, nimbostratus clouds don’t produce extreme weather system and you can always consider joyful indoor activities when these clouds cover the sky.